My husband has been trying to eat healthier in order to lower his blood pressure and his cholesterol. High blood pressure and high cholesterol run in the family and even at his age and despite being active, he still has them thanks to genetics. One are he was struggling with was packing healthy lunches for work. He needed “convenience” type foods that he could have made ahead of time and grab when needed. Mason jar salads seemed like the perfect option for him. We make a week’s worth of salads on Sunday night and put them in the fridge for the week. By the end of the week the salads are still just as fresh and sometimes even tastier as the veggies on the bottom of marinated in the dressing. The key is using wide mouth quart jars and stacking your ingredients properly. These are SO simple and quick to prepare and then you have a quick, easy lunch ready for you every day of the week! We made a variety of different salads so he wouldn’t get sick of eating them. I did a pasta salad which he said was awesome! 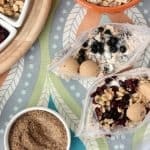 You can print off the recipes for each of these or pin them for later! Make these salads ahead of time and they will keep for up to a week in the fridge. 2 oz Cooked pasta drained-cook al dente and rinse with cold water after draining. 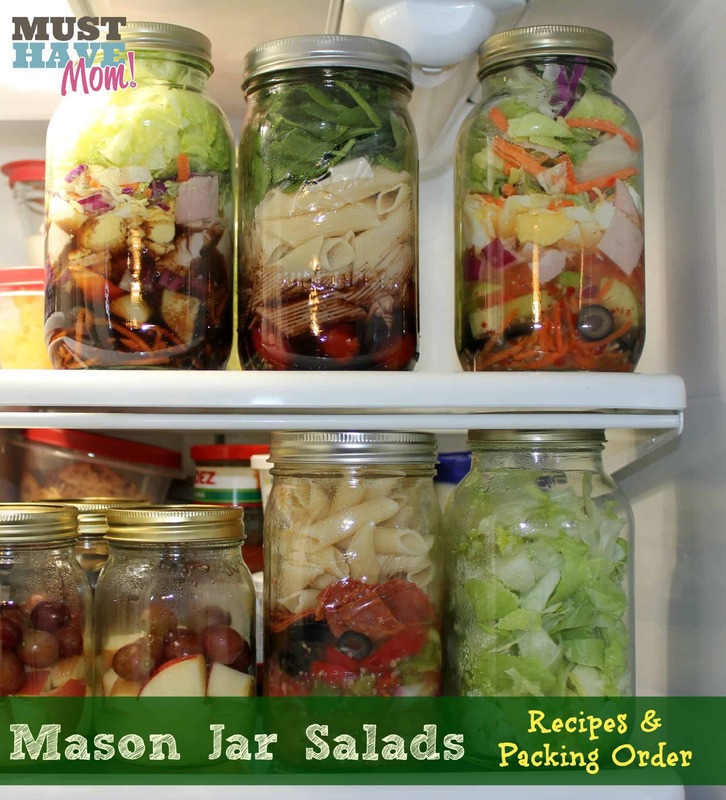 Mason Jar Pasta Salad Recipe: Put 2 oz Italian dressing on bottom of mason jar. Next add onions, green pepper, red pepper and black olives (in that order). Add pepperoni and top with cooked pasta. Put a lid on the jar and store in fridge for up to 7 days. When ready to eat just shake the jar and enjoy! 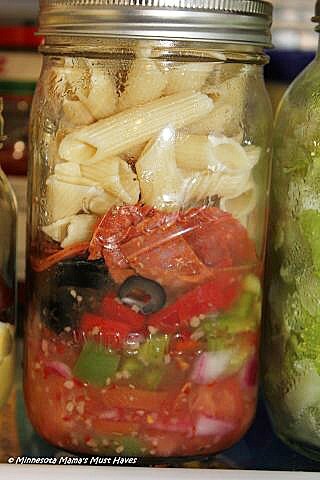 Caprese Pasta Salad Mason Jar Recipe: Put dressing on the bottom of the mason jar. Next add cherry tomatoes followed by your penne pasta. Top with fresh mozzarella pieces and then follow with the spinach and basil. Cover and store in the fridge for up to 7 days. Still tastes fresh on day 7! Shake and enjoy when ready to eat. Mason Jar Chef Salad Recipe: Put dressing on the bottom of the mason jar. Add in this order the following ingredients: carrot matchsticks, black olives, cucumber, tomato, green/red pepper, meat, eggs, lettuce. The amount of ingredients you use depends on your personal preference. You can only fit so much into the jar so if you want lots of lettuce you will need to decrease the amount of other ingredients you add. Mason jars and proper stacking of ingredients is key. Dressing on the bottom, lettuce on top! Hearty vegetables on the bottom. As they sit and marinate in the dressing they get better with time. The carrot matchsticks do best in the dressing and taste great even on day 7. The salads really DO stay fresh for an entire week. I was definitely skeptical but the verdict was unanimous that they stayed fresh and some even got better by the end of the week. If you pack your jars too tight it will be tough to shake it and eat out of the jar. Bring a bowl or plate if you plan on packing them tight so you can just dump the salad out and eat it. If you plan to eat out of the jar don’t leave too much airspace but don’t push down and pack tightly. You want to minimize air space. In order to eat out of the jar use a wide mouth mason jar to make it easier. If you have lettuce leftover after making your salads, put it in a mason jar. Our lettuce stays fresh so much longer in the glass jars! We always store it that way now. 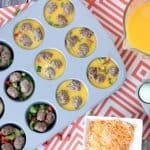 These aren’t only great for work lunches but also for busy stay at home moms. I find that I eat a lot of pizza and macaroni for lunch and having these on hand made it easy for me to eat healthy even when I didn’t have time to sit down and eat or prepare a salad for myself. They are the ultimate healthy convenience food! We also used pint mason jars for fruit cups. We used pineapple, grapes and apples and I added Fruit Fresh to each (find by the canning supplies) so it wouldn’t brown. The fruit stayed crisp and fresh and our apples didn’t turn brown. My husband wouldn’t take time to chop fruit and take it but when it was all prepared for him he ate it everyday! Have more recipes? Share in the comments below! What a great idea! So….you don’t have to vacuum seal it? I need to try this out. Nope, just put the lid on! No vacuum sealing required! I do the same thing with salads! I also like to use jars for soups and for my homemade desserts like fruited gelatin, pudding and mousses. I swear they work better than plastic refrig containers and the family can see what is inside the jars. I love mason jar salads. They really stay fresh and make eating a salad at lunch easy. This is brilliant! Healthy lunches are key, and the fact that you can prep them ahead of time is super. Thanks for the idea and recipes! I LOVE the idea of using mason jars for lunches and meals! So cool and simple to prepare!! I will try to make one of these. The pasta salad looks very delicious. Looks delish and what a great way to use mason jars! I like the sound of it lasting. Usually a head of lettuce lasts no time for me. They look great. I have some mason jars I could use for this. Thank you for sharing the recipe. such a great idea! never heard of it! going to try the pasta salad first! Have you tried a 24 hour salad in a jar yet? My grandma used to make it for holidays when I was a kid.. Wondering if it would work? Great idea! My Gramma used to make thing in and store things in jars all the time, its how she kept everything fresh when cooking/eating for one. I love your pastas salad ideas! love these so easy and saves you from eating out [fast food ] that I don’t need to eat. Great idea ,I can so I had the jars already …. Yea!!! I love this idea!! What size Mason jars did you use? 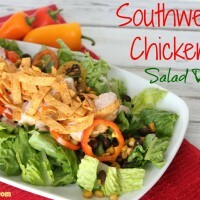 I tried the chef salad- made them yesterday and had one for lunch today! Lots more salad than I expected fit in the jar. Also, I noticed that you had some fruit looking jars as well in the picture- any secrets there? Thanks for the great ideas! 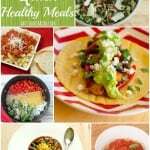 do you have more of these recipes?? Thank you 🙂 My garden is at it’s prime now so I am busy working on more recipes! I will update this post with a link once they go live. Which size jars do you use? Quart? What size jars do you use? 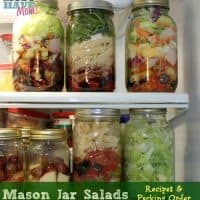 I tried it with the larger mason jars and it ended up being a lot of salad for one person! The salads are in quart jars. If you find them to be too large you could use the smaller pint jars but my hubby eats them as a meal and likes the quart jars. You can also get wide mouth mason jars that are “pint and a half” which is 24 ounces instead of 32 ounces. The sides are perfectly straight and I’ve used these for years for canning applesauce and storing broth because it is so easy to skim the fat off after being in the refrigerator overnight because of no curve at the top of the jar. I’m a 65 year old woman and the salads I make in these jars are just the right size for me. They are available at most grocery stores during canning season and online thru Ball/Kerr and also on Amazon. When your husband takes then to work, does he dump them out onto a plate and eat it? Yes he dumps them out on a plate although you could get the wide mouth jars and eat right from the jar. How do you seal these jars since it is cold ingredients? You don’t seal them you just twist on the lid 🙂 The jar in itself keeps them fresh in the fridge. They aren’t “canned” in the sense you are thinking. This is a great idea and the kids could help too. What i love most is that it’s a mason jar there is no plastic, glass is always the best. I can’t wait to try your recipe and this new way of keeping our foods fresh and yummy. thank you for sharing. I saw the idea of mason jar salads on Pinterest, but have never tried it. I found your things you have learned very helpful. my blog site is jennsthreegraces blogspot stop by sometime! I love making mason jar salads but never thought to do pasta ones! I like making salads in a jar because I make them all at one time. One mess to clean up! Great idea! I love how pretty they are too. These all look so good. I am a huge pasta salad fan so it is fun to see that in a jar!! The chef salad looks awesome! I love this! Very eay to grab on my way out the door in a hurry. great for lunches. And I love the mason jar way to store it. So cool! Do you buy the bag of lettuce or do you chop it? I bought heads of lettuce and chopped them, but you could buy the bag lettuce if you wish. I’m always looking for new salad ideas, thank you!